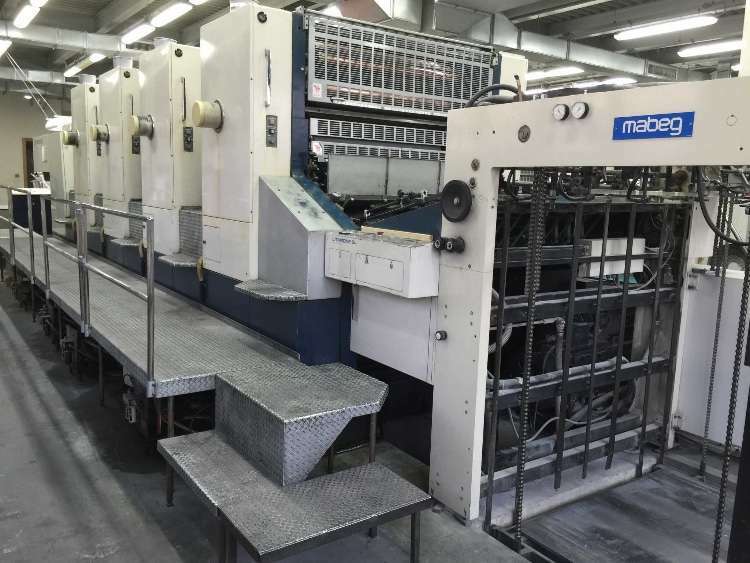 Dear Sirs, AS OWNER, We are pleased to offer you the following machine - subject to prior sale: KOMORI L450 Year 1991 Serial: 136 Four colour offset press 241 mio impressions Technical features: Max. speed:12.000 sh/h Max.sheet size: 965 x 1280 mm Min.sheet size: 540 x 760 mm Sheet thickness: 0.04-0.8 mm Max.printing area: 955 x 1270 mm Plate size: 1050 x 1315 mm thickness 0,30 mm Blanket size: 1220 x 1325 mm thickness 1,90 mm Dimensions: L. 13,5 mt. P. 4,3 mt. H. 3,5 mt. Power supply Kw 88 aprox Weight 72.000 Kg. (+ -) Accessories included: -Steel plate on feeder and delivery -Stream feeder with belt -Electronic double sheet control -Manual sheet thickness preset -Komorimatic continuous dampening system -4 Royse refrigerated recirculator -PQC ink and register control with remote control console -Quick action plate clamps with Bacher register -Automatic Blanket cylinder wash-up -PSS Plate reader -Double diameter transfer & impression cylinders (not chromed) -High pile delivery -Komori plate puch -Standard equipment -Oil drip pan, Tools, Documentations -Complete with all standard parts and accessories -Air-compresor -Powder Sprayer Status: Machine can be inspected in production in Milan, North Italy Availability: immediately All machines are offered in Euros and are subject remaining unsold. For further information don’t hesitate to contact us.